Github offers powerful collaboration, code review and code management for open source and private projects. Github also offers a flexible issue tracker lets you stay on top of bugs and focus on features. Customer support tickets often contain bug reports and feature requests. SupportBee's Github Integration lets you create Github issues for these tickets without leaving the ticket screen. The issue contains a link to the support ticket so you can follow up with the customer after closing the issue. The integration also posts a link to the Github issue as a comment on the ticket so it's easy to find the issue later. If you are managing multiple organizations and projects with your Github account, you can select the organization and project that you would like to create an issue in before sending the ticket over to Github. To add the integration, click on 'Add to My SupportBee'. You will be redirected to Github where you need to allow the integration to access your Github account. Once you authorize the integration, you will be redirected back to SupportBee and you need to click 'Save Settings'. 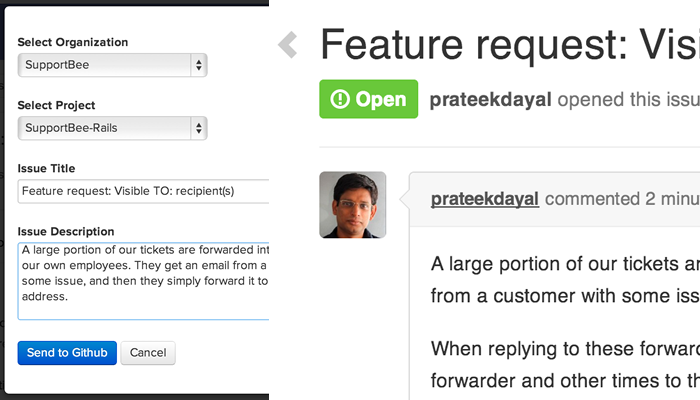 To use the integration, open a ticket and click on Integrations > Send to Github. You can select an organization and we'll populate a list of projects for the selected org. Once you have selected a project, you can send the ticket to Github. You can also edit the issue title and description before sending it over. A link to the ticket is automatically added in the description.